Resveratrol (3, 4′, 5-trihydroxy-trans-stilbene), a natural phytoalexin found in grapes and wine, has anti-proliferative activity on human-derived cancer cells. In our study, we used a conventional condensation reaction between aldehydes and amines to provide a number of aza-resveratrol (3, 4′, 5-trihydroxy-trans- aza-stilbene) derivatives in an attempt to screen for compounds with resveratrol’s action but with increased potency. 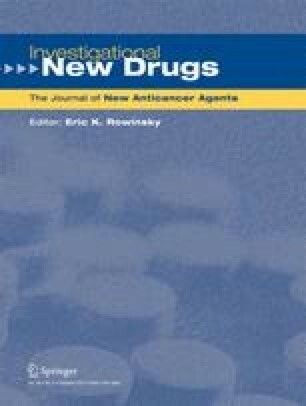 Aza-resveratrol and its hydroxylated derivative (3, 4, 4′, 5-tetrahydroxy-trans- aza-stilbene) showed a more enhanced anti-proliferative effect than resveratrol in an MCF-7 breast carcinoma cell line. To identify the cellular targets of the aza derivatives of resveratrol, we conjugated the latter aza-stilbene compound with epoxy-activated agarose and performed affinity purification. Macrophage migration inhibitory factor (MIF), a proinflammatory cytokine, was identified as a major target protein in MCF-7 cell lysates using a matrix-assisted laser desorption/ionization time-of-flight mass spectrometer (MALDI-TOF MS). The aza-resveratrol and its hydroxylated derivative, but not resveratrol, were also found to be potent inhibitors of MIF tautomerase activity, which may be associated with their inhibitory effects on MIF bioactivity for cell growth. The online version of this article (doi: 10.1007/s10637-011-9749-7) contains supplementary material, which is available to authorized users. We thank Eiko Honda for performing the MALDI-TOF MASS spectrometry, Yoshitaka Horiuchi for the microscopic analysis and Tomoko Kitayama for cell experiments. This work was supported by funds for the Comprehensive 3rd term of the 10-Year Strategy for Cancer Control, a Grant-in-Aid for Scientific Research from the Ministry of Education, Culture, Sports, Science and Technology of Japan (19209018).